Submitting website URLs, even that of blogs can help in promoting blogs and in optimizing search engine rankings and landing on Google search page rank 1. I came across a few entries in the Live Traffic Feed reporting of this blog. One entry shows full details of: "Newark, Delaware arrived from google.com on "Free Minds and Free Lines: Life Is Like Crossing A Busy Street" by searching for life is like a busy street." The individual was using a Mac OS by the way. 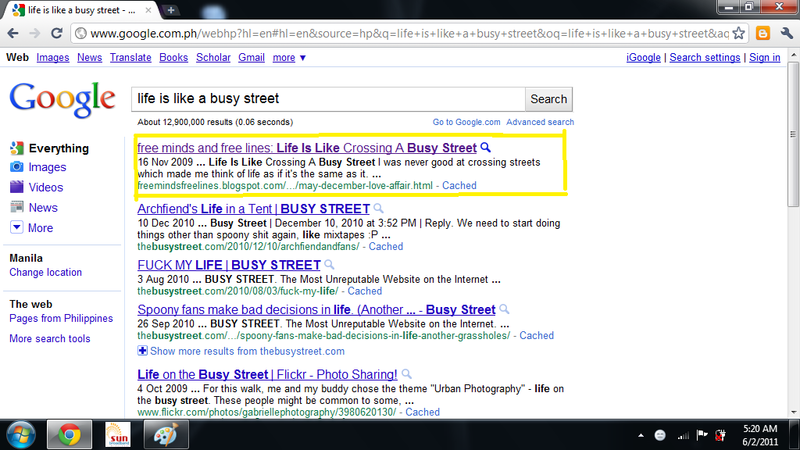 What compelled me to search for the same keywords is an idea from another blog. 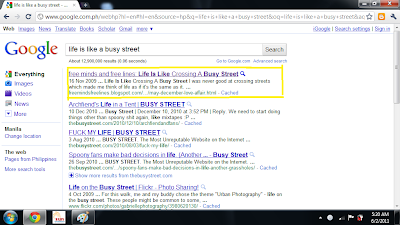 The blogger posted a blog entry with screen captures about his blog listed on page 1 rank for Google in relation to a few search terms. So I did the same and looked for keywords which landed some posts here to Google search page rank 1. Another entry goes like this: "Thailand arrived from google.co.th on "Free Minds and Free Lines: Old Poems Part 2 PART II: Love in Bliss and in Pain & PART III: Listen to Whispers of Hope" by searching for puny payapan." I could not figure out what the search terms meant even through online translation sites. They did not provide any results as well besides one entry which is from this blog. I did not bother to have the screen printed anymore because it was only a lucky hit. Yet while I'm writing this, another entry shows: "Aarhus, Midtjyllen arrived from images.google.com on "Free Minds and Free Lines: 2011 is a Year of Movie Sequels." Apparently, the area is in Denmark. I'm sure there's more to come. But for now, that's it for the Google search page rank 1 of this blog.